Fronted by the grand architecture of Ange-Jacques Gabriel, Hôtel de Crillon in Paris overlooks the stunning Place de la Concorde, one of the most majestic squares in the world! The heart of the hotel is the beautiful open courtyards that link the spaces surrounding them. Built at the behest of Louis XV, this grand building was once the family home of the highly regarded Count de Crillon. Helmed by architect Walter-André Destailleur, it was only converted into a hotel in 1909. Frequented by celebrities, politicians, artists, princes and queens, it re-opened in 2017 after a four-year face lift with highlights including chic guest rooms and suites (two even decorated by French fashion icon Karl Lagerfeld), four A-list restaurants, a spa and a brand new swimming pool. Architect Richard Martinet steered the entire restoration, including the landmark façade, while the interiors piloted by Artistic Director, Aline Asmar d’Amman were also designed by Tristan Auer, Chahan Minassian and Cyril Vergniol. Their vision – to retain the architectural treasures of this 18th century palace juxtaposed with the latest amenities of the 21st century – a celebration of modern French art de vivre. The décor of Brasserie d’Aumont echos the deep tonality of the plush salons in a bygone era. Landscape architect Louis Benech envisaged Hôtel de Crillon’s playful courtyards, the most charming being Jardin d’Hiver or winter garden. Sitting resplendently in the historic centre of the hotel, its walls awash in Mica stone, it unfurls itself between the dining spaces, leading into the classic Brasserie d’Aumont. Celebrated chef Justin Schmitt’s penchant for art was most advantageous when it came to crafting an authentic culinary experience at the Brasserie d’Aumont, central to the journey of timeless quintessential French cuisine. 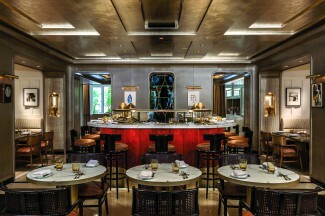 The décor of Brasserie d’Aumont amalgamates light and dark materials, echoing the deep tonality of the plush salons of a bygone era. 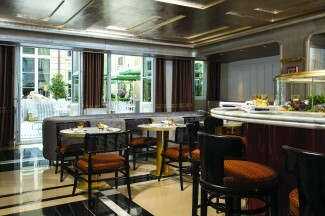 Designed by Tristan Auer, it has a distinctive Parisian vibe, inspired by the past but yet clean and modern. 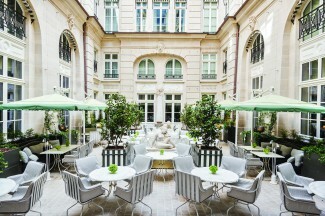 Located in the heart of Hôtel de Crillon, Brasserie d’Aumont is the setting for the Parisian gourmand and privileged world-traveler to enjoy a glass of champagne and enjoy la belle vie!